I originally heard about this book from an email about book two being on Netgalley. I don't know how I missed the release of this book, but I am so happy that I finally heard about it, because it was absolutely amazing!! I don't know how this series wasn't on my radar so, I am so happy to be writing a review on it today so that it can pop up on yours! The characters in this book were very well done. Mathers definitely invested the time to make them complex, unique characters who were easy to tell apart, but also felt like real people. I really enjoyed this characters and definitely wanted to get to know them more. Sam is a great main character. She hasn't had the easiest of lives (thanks to a curse on her family she doesn't know about) so she is stubborn, snappy, and not afraid to stick up for herself. This gets her into a lot of trouble and makes her very misunderstood. So when bad things suddenly start happening around Salem, she is the main suspect. Thus ensuing a "witch hunt". Sometimes when characters are being stubborn or act out and get into trouble they come off as bratty or annoying. Luckily, Same didn't come off this way at all. She has been dealt a tough hand in life and she is trying to deal with it, but it has become way too much. I understood why Sam was so angry and I was right there with her for being so mad. I really enjoyed her character and her character's growth. Did I think sometimes she was a little too headstrong? Yes, because it got her into some really bad situations that I definitely couldn't handle on my own, but I still got why she was doing it. I also really enjoyed the story line. It was the right amount of history mixed in with a modern day twist. At first when I read the description I had no idea how a modern day witch hunt was going to play out, but I think Mathers handled it very well. I never felt like it was too far fetched or couldn't happen in today's society, because it totally can and actually happens all the time. The number one thing I loved about this story was the mystery aspect. The who-done-it. Since I watch so many crime shows and mysteries, I always try to figure out who the bad guy/girl is before they tell the reader/watcher. In this book I really didn't know who it was until it was revealed. I had my suspicions and made a couple guesses, but there were about 3 people that I kept going round-and-round with. I couldn't pinpoint exactly who it was, but I knew it had to be one of them. Luckily it was one of them so I was still victorious. As I have mentioned in a previous review, if I can accurately guess who the bad guy is, or what is going to happen in the end, I never feel like the book is predictable. There is definitely a difference between being predictable and me just being a good detective who constantly watches for clues. For one, I read A LOT and for two, I took writing classes in college which taught me what to look for. I am purposefully trying to figure out the endings before I am told. Predictable is when the author isn't that great at writing yet and every plot point is obvious. This book was definitely NOT predictable. I was pleasantly surprised the whole way through. I absolutely LOVED reading this book! The characters were very well done and the plot was intense. 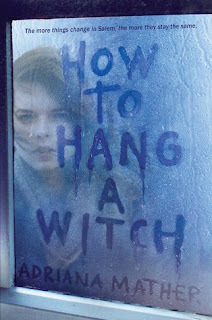 I was definitely very skeptical about how a modern day witch hunt would play out, but Mathers did it exceptionally well. I never found the plot to be too farfetched. For someone who normally does not enjoy historical fiction, I felt that this was the perfect balance of history and modern day. I always try and figure out the ending, but I wasn't completely sure who it was until I was finally told. I enjoyed every second of this book and I am so happy that I finally heard about it! This is a must read!